They need to switch providers. In the labeled crescent what is that light streak to the right of Krun Macula above the crescent of Pluto but still showing through the atmospheric haze? One of the moons? A bright star in the distance? There’s another one above the right side of Sputnick Planum. NASA is being very quiet over these 3 UFOs we do NOT know that they are Stars and if so which Stars (or Moons ) are they??? Excellent question, Steven! You are very observant! I’m guessing background stars. Someone must know for certain. Using Eyes on the Solar System and figuring out how to backup to about 12hr UT on July 14… I’m fairly sure the Big Dipper is off screen to the left and Pluto’s moons are all way below the view… Leo is possibly possibly below the limb of Pluto. Just to throw something out there the brightest star on the far right could be Procyon though that’s just a rough guess. I think Sirius is too far off the right. But I’m none too sure and then I still can’t get three stars in a row like that. Actually I also found that if you stretch the exposure to the point Sputnik planum is whited out you can see several layers of haze higher above Pluto. However I cannot see any other stars other than just one more. Those two much be pretty bright. Any idea what stars they would have been? Also in the same treatment if you look at the two largest mountains of Norgay Montes just before the terminator it seems the one closer to the observer is reflecting into the shadow of the father one. There is a dim spot there at the regular brightness but if you push it the whole night side is brighter. Looks almost like a good reflection of the sun into that shadow – perhaps the far side of the mountain is more like an ice-crystal face?? 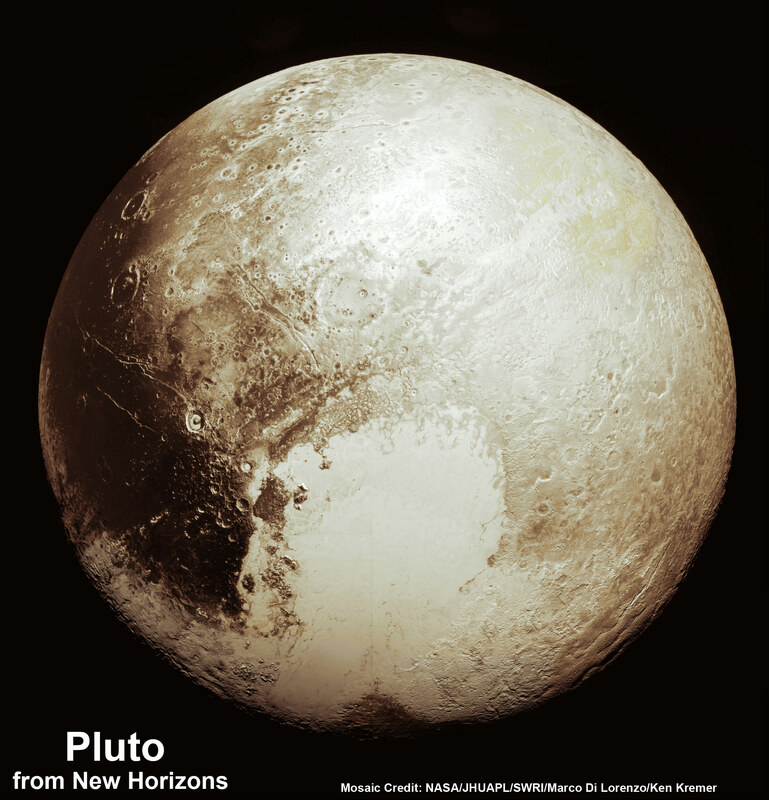 And to the right of the words for Cthulhu Regio there is a bright spot in Pluto’s shadow. If that is a mountain it much be fairly tall! There are only a few such dots of probably mountains poking into the light – one above the Norgay Mountes words, another to the right of that, and then another far left of the words for Cthulhu Regio – and this one way deep in the shadow area. Any confirmation?